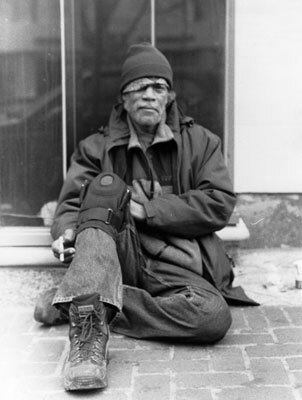 The homeless have a death rate that is four to nine times larger than that of those homed.i The value of clothing is often taken for granted because of its accessible nature, but clothing, especially shoes and jackets, is necessary for the homeless to prevent foot diseases, blisters, and to protect themselves from the cold weather. Shoes among the homeless are often in terrible condition or non-existent, which can lead to dozens of different diseases and disordersii. Studies have shown that the commonality of foot disorders, and diseases, can range up to 65% in homeless communities.iii Specifically, some of the disorders include infections, calluses, and even foot pathologies that have been connected to long-term disorders like diabetes.iv For most of the population these issues can be treated, if not cured, but for those with no money, they can have terrible long-term effects. None of these statistics should come as a surprise when you consider that about 48% of the homeless either do not have a comfortable pair of shoes, or do not have any shoes at all. Like shoes, the homeless are often in need of warm clothing to protect them from unforgiving weather. Cold weather can have many different negative effects, especially on those without proper protection.vi During cold weather, especially during winters, the homeless are subject to higher chances of illness and even have a greater risk of heart attack.vii Most of these issues can be counteracted by covering up with a few layers of clothing, but, sadly, with little income those without a home often are seen with torn or worn clothing, providing little protection from the harsh weather. There are many, many different extraordinary solutions to all these problems. Cities could build or renovate already built shelters to make them more appealing or allow them to be able to house more people. We could all be good Samaritans and allow the homeless to come sleep in our beds or on our couches, but the simple solution to fix many of these issues is to just donate old, unwanted clothing. Clothes can be donated to homeless shelters, thrift stores, or even just handing out the clothing to the homeless yourself. If everyone would donate all their clothing, rather than throwing it away when it became “out of fashion,” they would be benefiting not only the homeless, the needy, and the sick, but also our planet. Furthermore, big and small businesses can donate their unsold clothing rather than dumping it to keep their prices high. Though I doubt that America will ever get to a point where clothing is a small issue for the homeless, I hope that at least a majority of our population will try to act in making the already hard lives of the homeless a tad bit easier in whatever way they can.